Projects keep record on costs for using marketplace services. When signing a contract, the user must select a project from which possible related costs should be charged. Each customer profile has initially one project and additional projects can be created as needed. Projects have budget which can be increased by making prepayments to CNS. Currently, supported payment methods include only invoice and PayPal but more will be added later. Prepayments are a safe and easy way to control costs and avoid unexpected surprises. CNS will never charge user’s credit card automatically or periodically so there cannot be more costs than the project budget. Prepayments also lower money transfer costs which helps in keeping the pricing reasonable. Project related activities are summarized in monthly reports generated by the marketplace. 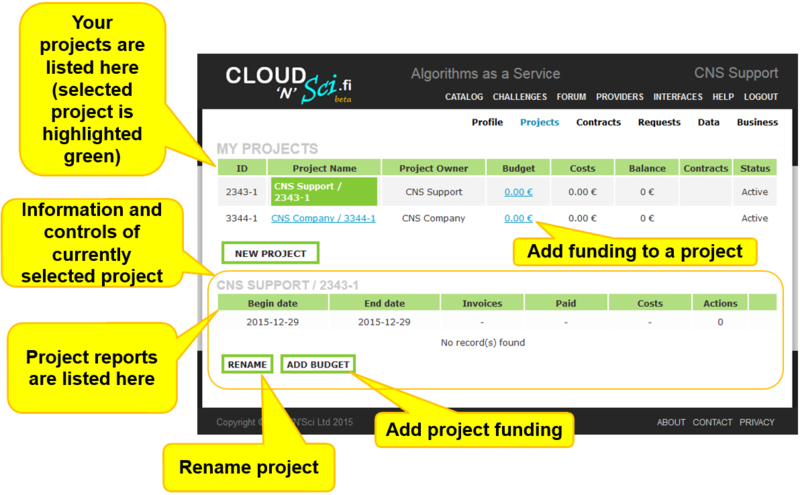 Project Name - Name of the project. Click to see project reports. Budget - Projects total budget (balance + costs). Click to add funding.